Luis Iga’s award-winning horror / slasher is already becoming a cult classic and Chicago will get to witness how this film breaks the diversity barriers in Hollywood with an All-Latino cast in non-stereotypical roles. 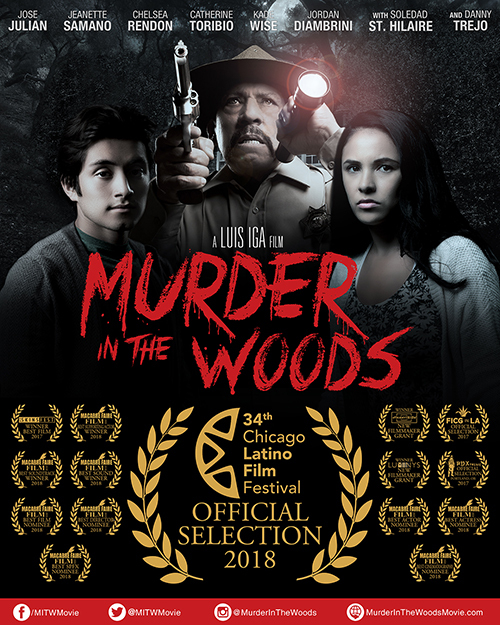 Chicago, IL, February 20, 2018 –(PR.com)– The award-winning horror / slasher film “Murder in the Woods,” directed and produced by Mexican filmmaker Luis Iga starring José Julián (A Better Life) and featuring distinguished actor Danny Trejo (Machete) has played to packed houses in Los Angeles, New York and Portland thus far and now will have its Midwest Festival Premiere at the renowned 34th Annual Chicago Latino Film Festival (CLFF), home of Latina writer and producer Yelyna De Leon. The film will play on Saturday April 7th at 9:15pm and Monday April 9th at 8:45pm. Get your tickets now before they sell out again. They are available here: http://bit.ly/mitwCLFFticketspr. “I received the news while I was at Sundance and I couldn’t contain the excitement. I want to thank Pepe Vargas (ILCC Founder & Executive Director) and the Chicago Latino Film Festival for being pioneers in reshaping how the world sees Latinos and Minorities in cinema. I’m honored and grateful to be part of this festival and thrilled to have the opportunity to showcase this film to the over 1.9 million Latinos that reside in Chicago,” said director and producer Luis Iga. CLFF began in 1985 and is produced by the International Latino Cultural Center of Chicago (ILCC), a pan-Latino, nonprofit, multidisciplinary arts organization dedicated to developing, promoting and increasing awareness of Latino culture among Latinos and other communities. The two-week Festival will take place from April 5 to April 19, 2018 and features opportunities for the audiences to participate in discussions with the directors at the screenings and at the series of special events highlighting the diversity of the Latino culture. “Being a Latina born and raised on the Southside of Chicago in the Back of the Yards, attending Curie High as a performing arts theater major, who has attended this amazing festival in the past, I am humbly honored and thrilled to bring it back home and have it premiere in Chicago at the Chicago Latino Film Festival. As Latinos in Hollywood, we need all the support we can get from our communities to show Hollywood that we are done with stereotypes, so I am extremely grateful to festival director Pepe Vargas for his support. Mr. Vargas is a force who has always advocated for Latinos and Chicago native filmmakers and is very much a part of the change that Hollywood needs, by showcasing films like “Murder in the Woods,” which I wrote with non-stereotypical roles for Latinos to star in. The lead character is a strong Latina from Chicago and some of the songs in our film are by Latino Chicago natives, so I know that audiences will have a great time watching this film, and I can’t wait to go back to my roots where it all started,” said writer and producer Yelyna De Leon. The award-winning film had its Festival Premiere at the legendary “Festival Internacional de Cine de Guadalajara en LA” (FICG in LA) at the TCL Chinese Theatres. “Murder in the Woods” has received six nominations and has won six awards including Best Film at the LA Skins Film Festival; Best Supporting Actor (Kade Wise), Best Sound Design and Best Soundtrack at the Macabre Faire Film Festival in New York; the Panavision New Filmmakers Grant and the Luminys Grant. The ensemble lead cast includes actors Jose Julian (A Better Life, Shameless), Jeanette Samano (ISA, Female Fight Squad), Chelsea Rendon (McFarland, USA), Catherine Toribio (Jane the Virgin), Jordan Diambrini (The Outfield) and Kade Wise (Lucifer). It also features Danny Trejo (Machete), Soledad St. Hilaire (Beatriz at Dinner), Kurt Caceres (Lawless Range) and Rolando Molina (American Dad!). “Murder in the Woods” is a production of REZINATE Entertainment, founded by Luis Iga. REZINATE partnered up with Yelyna De Leon to produce this film. Both graduated with an MFA in Film and Television Production from the esteemed School of Cinematic Arts at the University of Southern California (USC) where they met. REZINATE is an entertainment company founded by Luis Iga. The company is involved in the Production and Financing of audiovisual projects including Film, Television, Animation, Video Games and Virtual Reality. REZINATE has a global presence and clients and projects that are developed around the world. © Copyright 2018 Chop Chop Entertainment, LLC. All Rights Reserved.